Problem: This original, dark and dingy basement bathroom had remained untouched for the entire time our clients owned the home and was last on their list of projects. Their daughter was coming to live with them for a short period of time, so that was the impetus for the remodel. Not only was it outdated, but it was also non-functional. 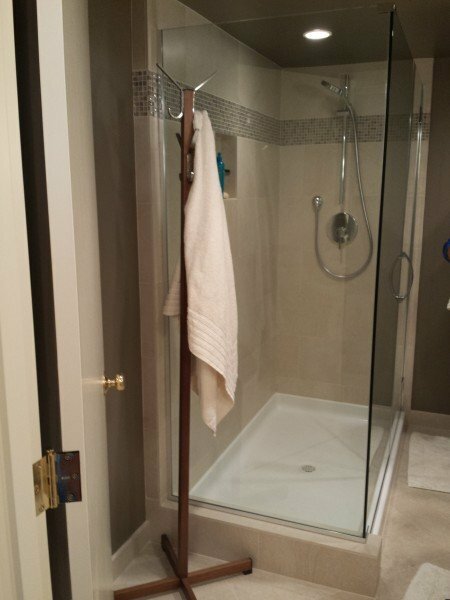 The separate bath and shower took up too much space and the vanity was too small and unusable. Also, there was no storage in the bathroom at all and the lowered, textured ceiling only added to the messiness. 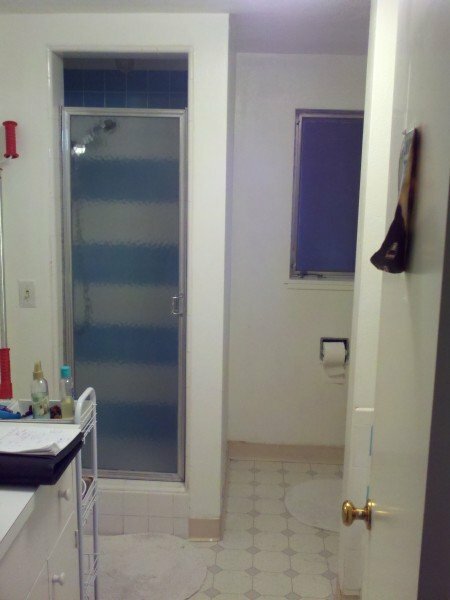 Solution: The vanity was relocated to the opposite wall because there was more existing wall space to tuck-in the vanity so you don’t feel like you are walking directly into it. 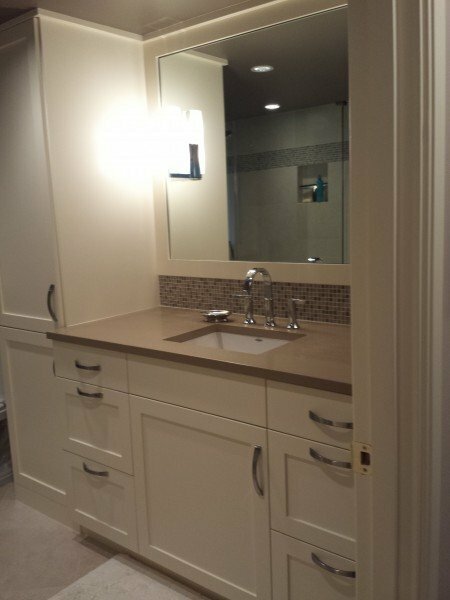 Also, a linen cabinet, complete with open shelving for reading material and TP, was added to hide the toilet and an existing soffit. The entry to the bathroom was widened 6” towards the other wall, making the bathroom feel much more gracious upon entering. We then increased the size of the existing shower and added a (2)-sided frameless glass shower door which expanded the space greatly. Now you can see the beautiful porcelain tile with glass mosaic border all the way to the back wall. Neutral, yet interesting colors add warmth and depth and the new layered lighting plan consisting of small recessed can lights with handmade glass sconces make the space feel light, yet cozy. The new bathroom now feels much larger without adding actual square footage. The clean lines, interesting fixtures, large format porcelain tiles and a solid quartz remnant for the countertop make for a beautiful, low maintenance bathroom. Tips: When dealing with small, dark bathrooms with little light, the trick is to make them feel bigger than they are by gaining inches wherever you can: ceiling height, doorways, etc. By providing proper layered lighting, combined with interesting neutral shades, your small dark bathroom will much more expansive. Also, I always recommend that the ceilings are painted the same color as the walls or 50% lighter so there is no hard stop at the ceiling line. This introduces a cozy, yet open feel to any space. To see some examples have a look at our bathroom portfolio. Your bathroom is designed magnificently and looks so pretty. Love the soft colors you choose to make it more spacious and luxurious. Some are look like spa rooms and really charms the heart.